Pastor Daniel daSilva has accepted the call to serve as the pastor for The Edge Christian Worship Center and Cambridge Church. Daniel speaks several languages such as Portuguese, Spanish, Italian and English. He has a BA in international Relations from University of Brazil Sao Paulo and a BA in Theology from Southern Adventist University in Tennessee. Daniel and his wife Wendy come with a lot of experience working with and on Pathfinder programs. While attending Southern Adventist University, Daniel served as a student pastor at Ooltewah SDA Church in Ooltewah, TN. Pastor daSilva comes with an understanding of how the church works having served as an Elder and as a Deacon. He has done home visitation conducting Bible studies with non-members. Daniel has also done literature evangelism, going to churches and schools both in and outside our denomination, showing our church literature and providing training for other Literature Evangelists. He has done health seminars working with multi-cultural communities, as well as even working with Jewish communities doing Bible studies with them. Daniel and Wendy daSilva come to The Edge Christian Worship Center with a desire to use their pastoral leadership to work with the church’s international community. They come willing to learn and to teach in order to create a community of faith that is trusting and growing. Join us in welcoming Pastor daSilva to The Edge Christian Worship Center and Cambridge Church. We believe that his personality, enthusiasm about his Adventists faith, his compassion and leadership abilities will help the churchs to became a Christian center in the community. We are happy to announce that Russell Meier has accepted the call to the Brainerd district. Pastor Meier writes that his desire is to work with the church members to foster discipleship by cultivating a culture of evangelism in the local church. He wants to encourage church members to use their unique spiritual gifts to reach their neighbors and friends for Christ. Russell did evangelistic meetings in Colombia for two weeks and saw several people come to Christ through his work there. He likes doing door to door evangelism, youth ministries, hospital visitations and member visitation, all of which are key elements to successful ministry. As an evangelist in Wilson, North Carolina (NC) he did a lot of home visitation, building relationships with the community, encouraging community members to attend a three week evangelistic field school in May of 2014. Pastor Meier comes with a knowledge of how the church runs, he has served as a church elder and as a church treasurer. He has had the opportunity to participate in church board situations, preaching, planning for worship and other church activities. As a local church treasurer he was instrumental in moving the local church to start using the electronic book keeping system, as well as preparing annual budgets for the local church. Russell was also responsible for teaching a baptismal class and led many of his students into baptism. We are glad that Pastor Russell Meier, his wife Dawn and their three children are joining our Minnesota Conference pastoral team. Shelina Rose Bonjour graduated from Union College in 2011 with Bachelor of Arts in Theology and Minor in Biblical Languages and a BA in Communication with emphasis on Public Relations. She has accepted the call to serve as the Associate Pastor in Andover district with Pastor Adam Breiner. Her ministry responsibilities will include Pathways Church, serving as the pastor. She will work with the congregation on a mission program that seeks to engage congregational participation in personal Bible study and community outreach. Shelina has led congregations in community outreach, and has been involved in training members in how to do personal Bible studies. When she worked with Campus Ministries at Union College, she led out in vespers, Week of Prayer meetings and community service projects. In her more recent church at Caldwell Seventh-day Adventist church, Idaho, she was serving as a Youth and Outreach Director, working with Pathfinders and Adventurers, providing pastoral care to the youth group through relationship building that allowed for church activities, and involvement in church programs. We wish to also welcome her husband David as he moves with her. The Minnesota Conference believes the well being of the family is of highest priority. The ability of the local church to play a vital role in the mission of the Seventh-day Adventist Church depends on the wellbeing and spiritual maturity of the individual family members. The role of husband and wife in the life and ministry of the church depends on the degree of their commitment to the mission and vision of their church. In a world devastated by divorce, the church needs to make sustained effort to build a Christ-centered loving relationship among a husband and wife. 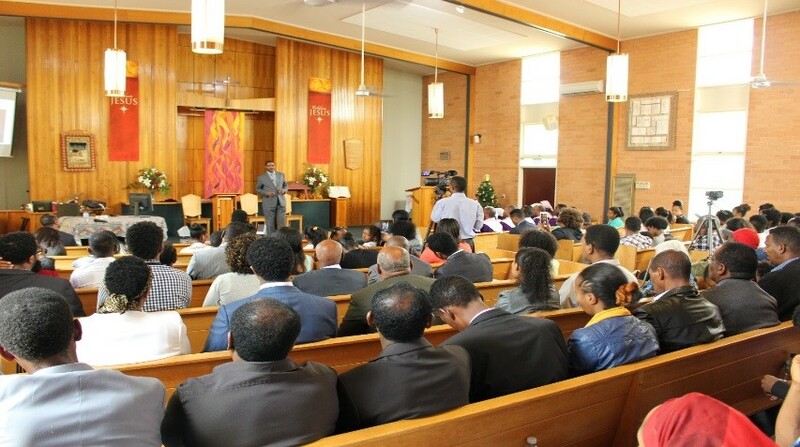 To this effect the Oromo Seventh-day Adventist church has a special time for couples of the church. This is the time dedicated to family life with the objective of sharing experience and encouraging each other. Knowing this fact, members under the leadership of Minnesota Conference budget, their time systematically to support the local churches through visitations, conducting workshop, and giving trainings. In December 12, 2015, Elder Brian Mungandi presented a life transforming, culturally appropriate presentation at the Oromo Seventh-day Adventist Church. He focused on the important lessons that need to be learned by husband and wife that has moved to a fast moving life in advanced economies. Pr Brian emphasized the importance of quality time among husband and wife, and with their children. His message was on Ephesians 5:33 and other Biblical principles. He pointed out that by being patient with each other, having good dialogue, praising each other, sharing time with each other husband and wife could build their marriage. By following the Biblical principle of marriage they can save themselves and their children from the danger out in the world where marriage can be easily dissolved like a business enterprise. The only safety to the family is being established in the God who established marriage as an institution of supreme importance. The Oromo Seventh-day Adventist Church appreciates the time taken by Elder Brian Mugnadi to talk with the families of the church and share with them the vision and mission of the Minnesota Conference and the world church at large in reaching out to the millions of family members who don’t have God in their affairs. The night of December 12, 2015 was a time of great blessings and encouragement from Elder Mungandi. The Minnesota Conference of Seventh-day Adventist Church has a rich experience of reaching out to the immigrant community with the good news of the Gospel. Time and again it has reached out to Seventh-day Adventist Churches outside of the NAD and the result has been very encouraging. Did the leadership in Minnesota Conference know that the immigrant churches they support could play a vital role in a conference located half way around the globe? We have a true story to share with you. In a 2015 a service request was sent from Victoria Conference to conduct another revival meeting on January 1-3, 2016. The meeting was attended by about 200 people. Some of them came from as far away as Sydney and Perth to Melbourne. It was a great time of revival. About ten people rededicated their life to be part of the ministry of the church. Now the small group in the City of Melbourne has become a well organized dynamic church. Those of us who took part in the effort did not have time, but we trusted God that He would bless our humble effort and use it for a great cause. We appreciate the visionary and able leadership, as well as the Board of Trustees at the Minnesota Conference for encouraging us to reach out to the brethren in Melbourne. In each step the leadership of the Minnesota Conference was involved in counseling and praying for those of us involved in an effort to reach out to the children of God with the message of hope built in the firm belief of the soon Coming of the Redeemer of this troubled world. The exemplary actions taken by Minnesota Conference is a good example of how one entity of the Seventh-day Adventist Church can play a vital role outside of its territories. We may be short of financial resources but we have been able to minister, as well as do a lot with the small means. God has the ability to multiply our little resource and use it for a big cause. Looking back, I have a great joy to see a thriving church in Victoria Conference. The goal for the Kenyan Community Church (KCC) in 2015 was to do a mission trip into Kenya. The preparations started early in the year with the help of a local evangelist Brother Nimrod Magati. The church finally choose to go to Tabaka-Kisii in the western part of Kenya where the Adventist church has no presence. The area is dominated by the work of the Catholic mission hospital and the church’s philanthropic work in the area. Elder Moses Makori, Personal Ministries Director at KCC, left earlier to go and make sure everything was in place. In Nairobi, he met with a team from the Colleges Adventist Student Organization (CASO), about 50 students volunteered their time to be part of the three weeks evangelistic campaign conducting a Medical Camp. The daily program was as follows: a) Personal devotion b) Physical exercise c) joint devotion and breakfast. By 10am all participates met to go for house to house visitation, literature distribution and personally inviting people to the meetings. At noon, the evangelism team came back for lunch and rest. At 4 pm they would have a marching parade with loud music. In the evening, Evangelists Nimrod Magati and Eliazer Obure, the local evangelists preached the everlasting gospel in the local language. These were joined by the KCC mission team, Elijah Nyambane, Geoffery Maronga, Steve Magusa, Rhonda Nyambane and others, on the second Sabbath. By the end of the three weeks, 95 souls were baptized. These were all first time Adventists. The local Pastor and the Conference President Dr Julius Bichanga appreciated the KCC work. In the words of the local Conference President, “This is the first time we know of that brothers and sister in diaspora have come back to do such a great work like this.” Thanks to the Kenyan Community Church and the Minnesota Conference Board for the support. The Church’s next goal is to have a worship place for the souls that were baptized. Negotiations for land of where to put a place of worship are under way. Jose Torres has accepted the invitation to be the new Youth Director for the Minnesota Conference of Seventh-day Adventists. Pastor Torres comes to us from the Lake Region Conference where he has been serving as a fulltime pastor in the African American Churches in Fort Wayne and Marion, Indiana where he was serving as the Pathfinder Executive Coordinator for the conference. Since graduating from the Seminary, Jose has been involved in mission trips and several evangelist meetings in the United States and outside in places like Lima, Peru and the Dominican Republic. Pastor Jose Torres is an ordained minister, has a Masters of Divinity degree from Andrews and a BS in Business Management from University of Phoenix and as well as four units of Clinical Pastoral Education. He served as a youth pastor and as a Chaplain in Fort Wayne, Indiana. Jose’s experience includes leading out in many ministries that are key to the church, pastoral ministry, evangelism ministry, Pathfinder ministry, Young Adult ministry and even Chaplaincy ministry. We strong believe that the Lord uses Pastor Torres and his wife Zoey to impact the lives of thousands of young people in our Conference. Talking with Pastor Jose Torres he said, “I see youth ministry as an important ministry. Part of youth ministry is discipleship and soul winning so we will endeavor to point our young people to Christ and build relationships with them. My wife Zoey and I are the proud parent of two beautiful kids a boy Javan (age 9) and a girl, Adrialyz (age 2), as a family we love youth work.” Jose says his first tasks will be to form relationships with the youth leaders in the conference, working with parents to make sure that our youth program is continuing as smoothly as possible. He is excited to come to Minnesota. Pastor Jose Torres is bilingual, fluent in English and Spanish. He said “I loves reading, electronics, playing basketball, camping, biking, traveling, photography, videography, and just having fun. We are looking forward to settling in our new ministry here in Minnesota”. Please join us as we welcome Jose, Zoey, Javan and Adrialyz. May God bless this family as they begin their Ministry.